We had our monthly luncheon the first Wednesday of the month at Centennial Golf Course, there were only eight in attendance. We did have a couple of show and tell projects. We had one new member, Paul AG7AA, and he and his wife are new to the area, they are buying in Grants Pass and though he has nothing up at the moment, he is in the process of getting his station on the air. There are now twenty-three members on our local mailing list now. And though we do not have a formal net control, the word is sent out by Bill N7EU every week. He also sends reminders that we are meeting after Wednesday net for luncheons. The next luncheon will be December 7, 2016. The 22nd Annual VHF Conference was a terrific success. See our Conference Proceedings and the 2016 Photo Gallery for complete information and to download the presentations. With 12 bit A/D conversion and very sharp 5th order Chebyshev filters, the RSP allows you to process a massive chunk of 10MHz of radio spectrum all in one go. Great noise factor, great sensitivity and perfect for all the popular SDR software packages. Sample frequency ranges from 2 MSPS to 10.66MSPS, with 10.4 ENOB, 60dB SNR, and 67dB SFDR. After lunch several members joined up (read: snuck out) at the local Harbor Freight candy store to browse. Honest, just only to browse a little! Next month, we decided to go to The Sandwich Factory on Riverside Avenue in Medford. Thank you everyone who converged in Castle Rock at Parker's Restaurant for receiving another fine meal and for transmitting all these elaborate lies about VHF activity. People came from Washington, Oregon and British Columbia. Personally, I was very happy to attend after spending the last six months taking care fulltime of my ailing father. It was very nice to meet our newcomer Todd KI7BNA. Thank you to all who came out for lunch Saturday, We had a good turnout of 10 folks. It's good to see ham friends more than once a year at the annual conference. Next Dry Side lunch in a couple of months, location TBA. If you have a suggested location please email me. Stay tuned to the e-mail reflector. We got four of the group together (most of which are named 'Bob') for lunch at Miguel's and two more joined us later. Our new member Don WA7DCG is running an IC-7100. Bill N7EU had jury duty and was unable to attend. The weather was too good: the rest stayed home. Due to the small turnout for lunch, we did not have any show and tell this time. Bob Moore KG7YCB and Bill K7WGD both bought Yaesu FT-991 all-band transceivers. The June luncheon will be held at Bobbio's in Medford June 1, 2016 at 12:30. 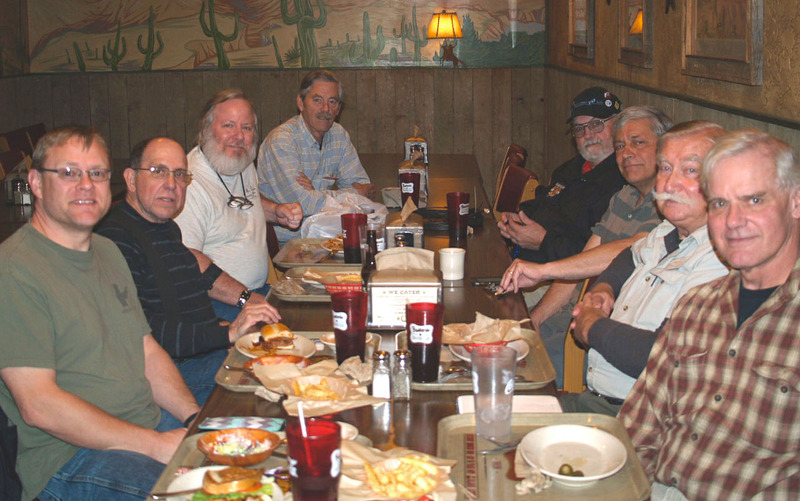 There were 7 of us who got together for a luncheon (12:30) after the regular rag chew on Wednesday Morning. We met at "Wild River Beer and Pizzeria" for our monthly luncheon. Due to an early Spring day, some of the group decided not to show up. We didn't have any new antennas to pass around, so we took the opportunity to exchange eyeball QSO cards and the seasoned people were able to answer questions of new people coming on. A new FM repeater is in the valley (145.410, no tone and unlinked) and has excellent coverage. It's a good machine to use as an intercom. Our next luncheon will be at Miguel's in Eagle Point on May 4, 2016 at 12:30. 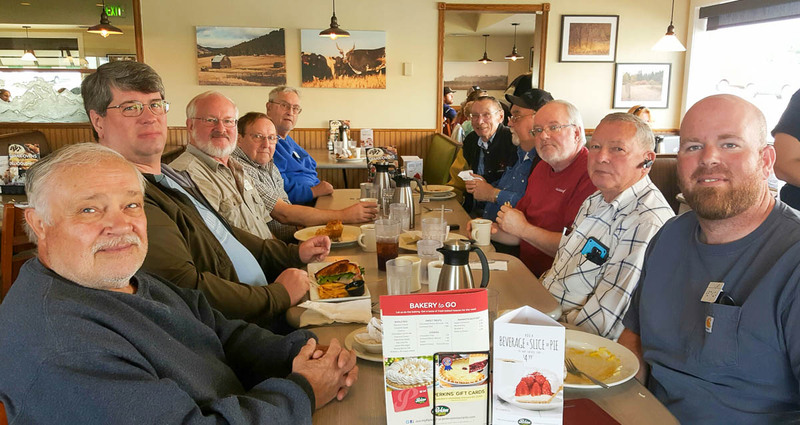 Ten of us enjoyed lunch at Buster's BBQ in Tigard, Oregon, on Saturday 3/26/2016 from 11 am - 1 pm. We talked about cancellation of the ARRL August UHF Contest and encouraged people to submit a log - on paper if that was all they can do for that contest. I think it's something we need to focus on for August 2016; everyone should log and submit. We talked about scheduling a south side gathering every couple of months at Parker's Restaurant midway between Portland and Seattle. People seemed to like it better and also some CN87 folks show up at that venue. Volunteers have stepped forward from all over the country to help sponsor the 2016 August UHF Contest, which will be held as scheduled, but without ARRL sponsorship. Many, many people love that contest and are willing to help make it happen. Since PNWVHFS had the most logs of any club last year, you surely want to make certain the contest happens in 2016. So please mark your calendars to get on 222 and up on August 6-7, 2016. When I send out a mailing listing the volunteers, may I add your names and the name of PNWVHFS as a sponsor? I promise you won't be alone: leaders of the Mt. Airy Packrats, the Northern Lights group (in MN) and many others are helping to put on the contest. What we all hope is to maintain continuity by having the contest this year while ARRL's revitalization subcommittee decides whether ARRL will sponsor the UHF contest in the future and under what rules. I hope we do have ARRL sponsorship so our volunteer effort is only a one-year venture. Being a sponsor doesn't entail a lot of work. One of the log-checkers who does large ARRL contests is volunteering to handle the logs this year. The regular author of the result article for the August UHF Contest is willing to do the article about the 2016 contest, even if it appears only online and not in QST. Someone else is paying for the club gavels and other awards. NLRS gives an award to the top 3-band rover. It's open to non-members as well as members. That award will also be given this year. Please join us and in the publicity for the 2016 August UHF Contest. The ARRL August UHF Contest for 2016 has been cancelled, while the ARRL VHF Contest Revitalization Committee considers alternatives. The Contest Revitalization Committee fielded dozens of comments from members concerning possible changes to this annual UHF operating event, traditionally held on the first weekend of August each year. Many commenters expressed dissatisfaction with the timing of the contest, occurring as it does at the hottest time of the year, and that it was too close on the calendar to other VHF/UHF events. In response to this member input, the Contest Revitalization Committee recommended to the Programs and Services Committee (PSC) that the 2016 August UHF Contest be cancelled, and the PSC agreed. The ARRL VHF Contest Revitalization Committee continues to study the possibility of redesigning or replacing the August UHF Contest with a similar event at another point in the calendar - possibly in the spring - for 2017. The Committee will solicit member comments in the near future, as it weighs several alternatives. Welcome to new members in Feb: Steve K7DNA in Talent, OR, Grant KB7WSD in Everrett, WA, Rusty K7RMO in Sherwood, OR, Ken VE7KPB in Cranbrook, BC, and Ron KF7UVH in Woodland, WA. We met at Miguel’s in Eagle Point, OR for our monthly two meter get together. There were eleven guys present, and though there was no specific topic, we were all in agreement: we will continue with the two meter net on Tuesday nights (144.200) but that we should also use six meters (50.125) on Wednesday mornings, thus putting both bands to use, as well as making our presence known to the local community. We feel that by using both bands, the local hams will know and use them. Also, it will give the active members a better idea of where to go in the case of an emergency. We meet on the first Wednesday of the month. Our next lunch date is 12:30 pm at "Debbie's diner" near Phoenix, OR, and the talk-in frequency is 147.00 with a tone of 123. We are a "round table" net and include ragchewing and sharing VHF tips. The nets are very informal. No net control. Everyone welcome to join us Tuesday night 7PM and Wednesday morning 10AM on 144.200 SSB. Most of us have modest antennas and power. Some use verticals, halos and small yagi beams. Activity is mostly local in the Rogue Valley but we do hear and work hams in Klamath Falls and Grants Pass. We are trying to encourage local activity and participation on a weekly basis. I am finding the guys are building antennas and look forward to giving each other signal reports or just helping each other out. 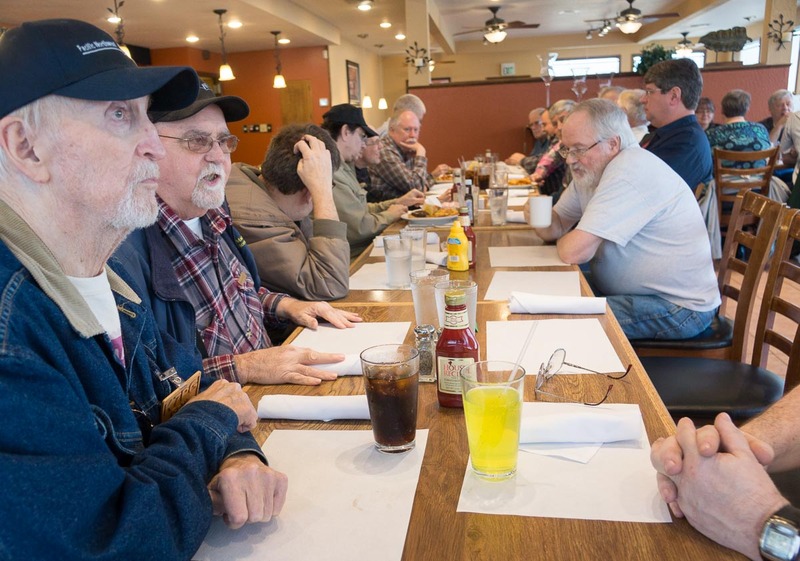 A big group of VHFers enjoyed lunch at Parker's Steakhouse on Saturday. Welcome to new members John W7FU, Michael KA7HBB, Tree N6TR, Richard WD6HDY, Steve W7SJT (was K7PZN), Stacey KG7YES, William KD6LTD, Phil AF7GY, Ken W7DYX and Kelly K7MHI. Whew! That's a bunch. This calendar year we started with Veda KG7OOL #524 joining us in January, and finished with Kelly K7MHI #570 on New Year's Eve. All told, 47 hams joined us in 2015! I look forward to meeting them and seeing many of you in 2016. Happy New Year!